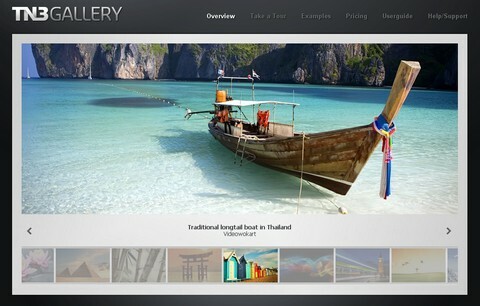 TN3 Gallery is a full fledged HTML based customizable jQuery image gallery with slideshow, transitions and multiple album options. It is compatible with all modern desktop and mobile browsers. And it is powered by our beloved jQuery. With TN3 Gallery you can easily create amazing photo galleries and slideshows with multiple albums, image preloading, dynamic image sizing, mouse wheel navigation, optional captions, thumbnail carousel, CSS skinning, XML and Flickr support. TN3 Photo Gallery looks really clean and easy to use. There are 5 transition styles you can choose to use, including fade, slide, blinds, grid and none. All transition styles are very smooth. It works really well on photo or image gallery sites. You can download the free lite branded version for the basic functionality, or the unbranded professional version for extended features. What are you waiting for?